We race exclusively with limited-modified Gas Stocker motors all with affordable 100% stock parts at Galletta's at Oswego, NY, and other tracks where allowed. 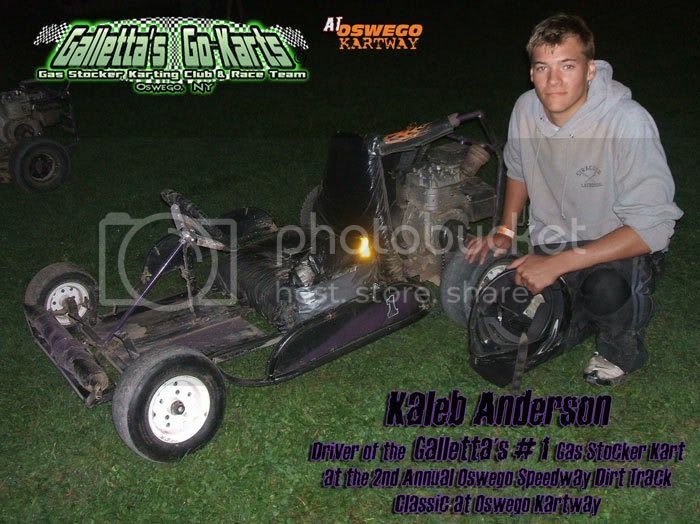 Kaleb Anderson with the Team Galletta's Gas Stocker #1 Kart after the 2nd Annual Oswego Kartway Classic on September 4th, 2008. Fun Fact: The Galletta's #1 Kart, originally the 2nd Galletta-Type Race Chassis to be built from scratch (a 1998 model), was rebuilt to be even lower to the ground and given side nerf bars in 2008 per the new 2008-09 safety measures. This is the first close-up picture taken with it since the rebuild. The most unique thing about Galletta's Gas Stocker Racing is that we frown upon prefabricated karts and build our own. 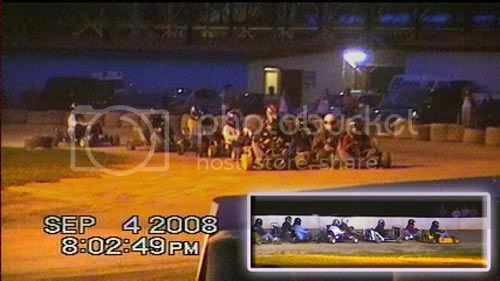 This not only breeds originality and ingenuity, but also befuddles the people used to the formulistic racing of the average WKA-type karting event. This is one reason why our brand of racing not only is the most affordable, but you can't just buy a book, or read a trick or two on the internet, or buy an expensive prefabricated machine to score wins. If you win, you'll earn it via on-track racing experience, not via big bucks like other racing organizations. Kaleb's first race was the 2008 Oswego Speedway Dirt Classic (AKA the infamous Jimmay's dust bowl screw-job) in the Galletta's Gas Stocker #1. Last word is that he will be driving a kart of his own with us during the 2009 season, but then he never did.